“We include women in all cash transfer activities, but this is not ‘gender work’. We all know that women give anything they receive to their male guardians.” So said one of the managers of a prominent humanitarian organisation in Yemen when discussing the role of women in aid distribution. During emergency relief efforts, when the entire focus of national and international humanitarian organisations is on meeting people’s most basic needs – such as food, water and medicine, gender is not considered in terms of equality or justice, but only as a dimension of vulnerability. In such situations, women tend to be designated a more vulnerable group than men. There is however a danger in only portraying women as helpless victims during emergency situations. Continuously treating them as passive recipients of aid over a long period of time will increase their dependency – and hence their vulnerability. Moreover, thinking of them in terms of vulnerability alone ignores their resilience and resourcefulness. 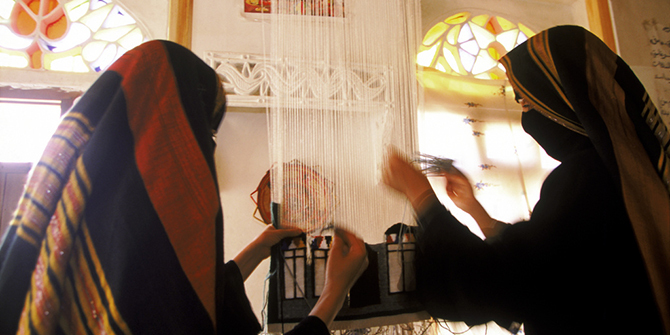 Women in Yemen have strong social networks, possess detailed local community knowledge, produce food and crafts for income generation, and in some areas are even becoming solar energy technicians. They also frequently access the ‘men’s realm’: approaching sheikhs and community leaders for support, borrowing money, or going to armed groups demanding justice or the release of their loved ones. Following the ‘Emergency Relief’ phase of humanitarian response is ‘Early Recovery’. During this phase, it becomes crucial to understand gender relations and power dynamics within the local community, as well as to explore the causes of vulnerability and gender inequality, in order to design longer term programmes for social cohesion. While it is clearly important to continue delivering aid to women in need, it is crucial to treat them as partners – not just victims – and to consider their agency and capacity for action. Women should be a part of humanitarian response in terms of what they can contribute, as well as in terms of vulnerability. Giving some focus to gender mainstreaming during emergencies is not as irrelevant as many people would think. Gender justice prepares the way for moving from immediate emergency relief to long-term development, and provides us with the tools to improve humanitarian assistance. Ghaidaa Motahar is a gender specialist, with a master’s degree in Political Science from Warsaw University. She is the Founder of Safe Streets Foundation for Development, a Yemen-based NGO focussed on gender and development. She tweets at @GhaidaaMotahar.